Water. This precious resource can truly be taken for granted. Sure, you can walk over to your closest faucet and turn it on. Look at it flow! It’s just always there for you like a bill in the mailbox. Until it isn’t. My whole life, I’ve never given much thought to NOT having water. Even as our homestead plans went forward we knew we’d drill and have a well. 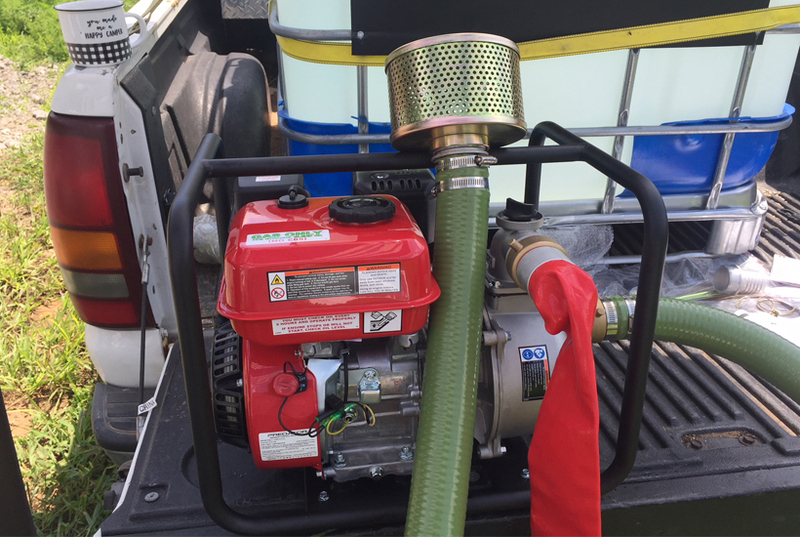 We knew we’d use IBC for backup water containment. Uh huh. We also didn’t know what we didn’t know. IBC stands for Intermediate Bulk Container. This type of container is used as a hybrid form between drums and bulk transport. IBC’s allow manipulation with forklift or pallet trucks, but cannot be handled by hand, such as drums. Two wells have been drilled. One for the area where Mr. Bluejeans and our daughter Jamie will build our homes. The other for Gigi and our daughter Sammi’s family in the area where their homes will be erected. At this point we aren’t quite sure if our well is entirely viable because of the amount of sludge the well guys kept bringing up. Since Gigi’s house is in and the electric hook up is days away we are concentrating on her well set up. There’s a daunting amount of information on the internet about wells. 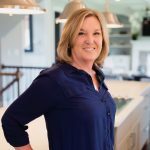 We had a well at our last home in Wisconsin but the farmhouse we lived in was a rental and we had no idea about the system other than we had VERY hard water and the softening system went through much salt. Finally having our farm is wonderful but every once in a while I miss solving my problems by merely calling the landlord. So now we are up to our eyeballs in opinions. The well company that drilled Gigi’s well thinks we only need a 36 gallon pressure tank. We’re not sure about that. We’d like more on demand especially since it will feed two homes in the future. There are constant pressure and standard pressure tanks, each with facts as to why they are the best. Not to mention researching what the options are to increase output for a low flow well. Plus we are pretty sure we will install cisterns to pump the water to where it will intermingle with our rainwater catchment system. I swear, the thought of just permanently refilling bottles from our IBC is looking better day by day! However, these choices are all blog posts to come. Today I’d like to share what we are doing for our dry camping situation. 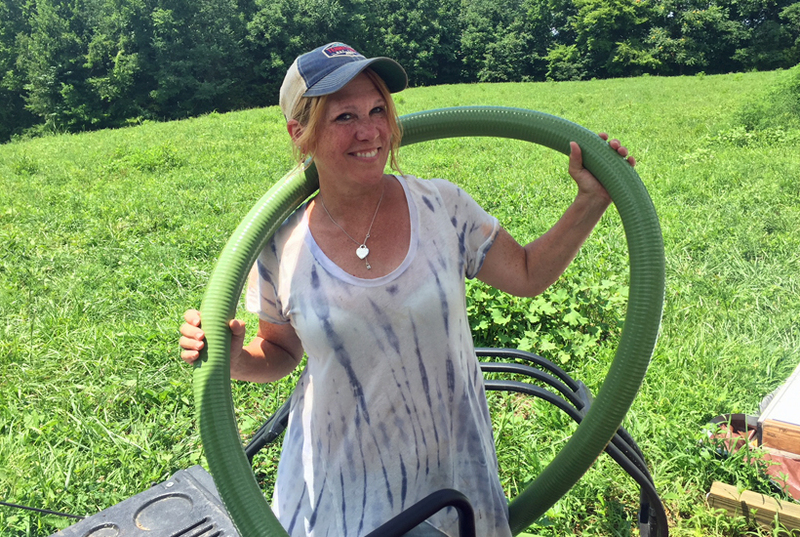 Since we first brought our IBC’s to the farm, filling them has required much manual labor. We bought a hand siphon thinking this would do the trick. We would just pump from the fresh water IBC to the one we have on our newly built platform. Or not. 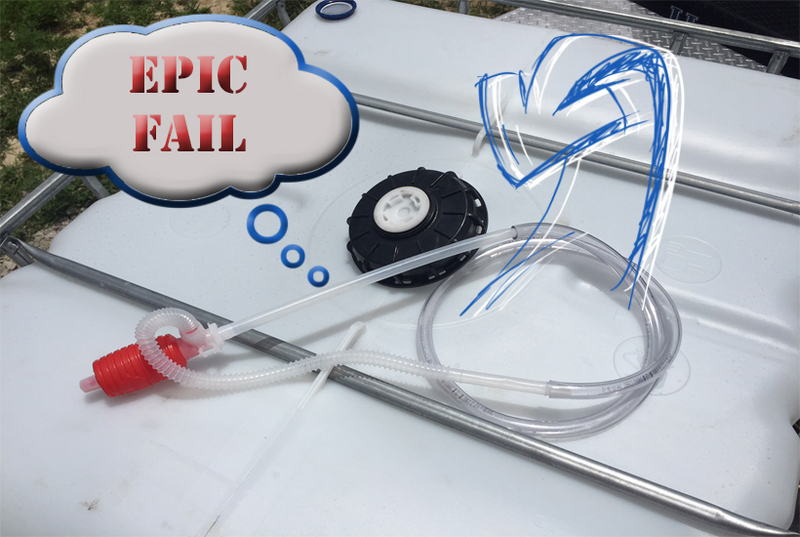 The hand pump was an immediate epic fail. It was unable to create any suction what so ever. I don’t think it could’ve transferred one glass of Kool-Aid to another glass let alone transfer 140 gallons of water from one IBC to the other. I’d been wanting a water transfer pump for some time now and Mr. Bluejans and I happened to be looking for another item at Harbor Freight when we spotted a Predator water transfer pump. We already own a Predator generator and love it. It just so happened this water transfer pump was on sale! Kismet I say. 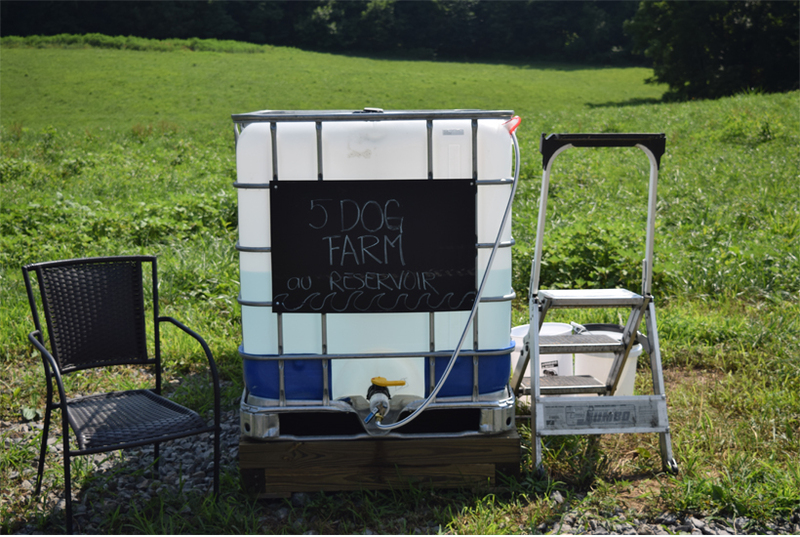 Excitedly, we brought our new purchase home, set it up, primed the pump and then…. at the very last second… Mr. Bluejeans read the disclaimer statement on the hoses… Contains Lead. If murder were legal there’s a chance Mr. Bluejeans wouldn’t be with us. “But Judge, he actually read the label!” I know the jury would find me innocent. Turns out both the intake and discharge hoses contain lead. Now this is fine for grabbing pond water to put out a fire BUT not for transferring our drinking water. Swell. Try finding food grade fire hose. No, don’t… I like you too much. Needless to say, I am still looking for food grade intake and discharge water transfer pump hoses. So how did we handle getting our newest load of fresh water into our existing IBC sans mechanical devices? 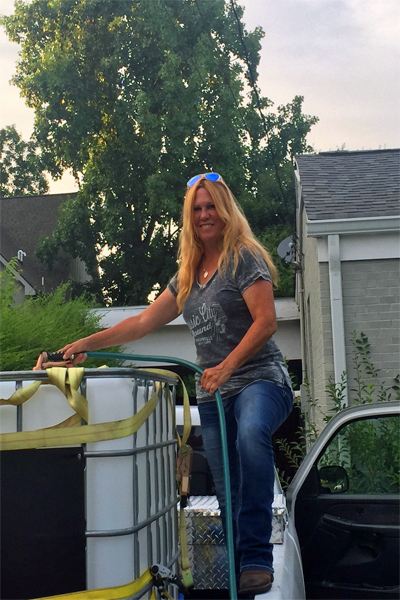 We used our camping hose (food grade I’ll have you know) to manually fill a couple 7 gallon Aqua-Tainers and then climb up a step ladder to dump each and every one into our holding IBC. Ya, very technical. 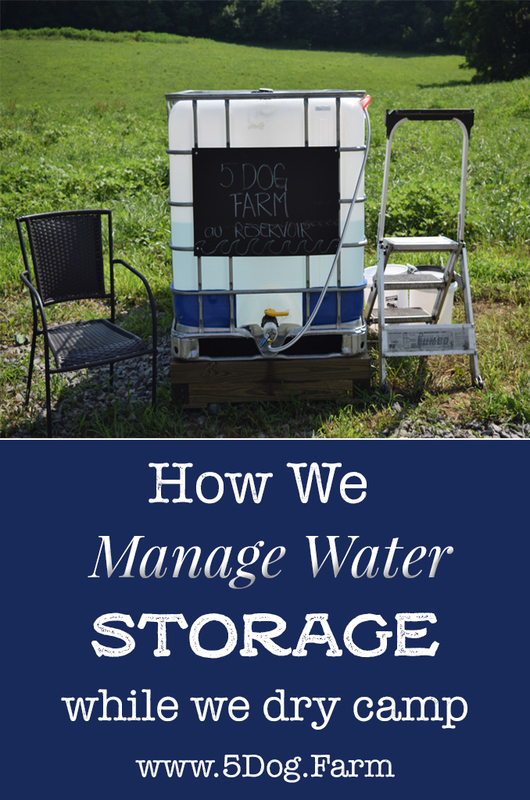 We did this about a million times since we were transferring 140 gallons of water. 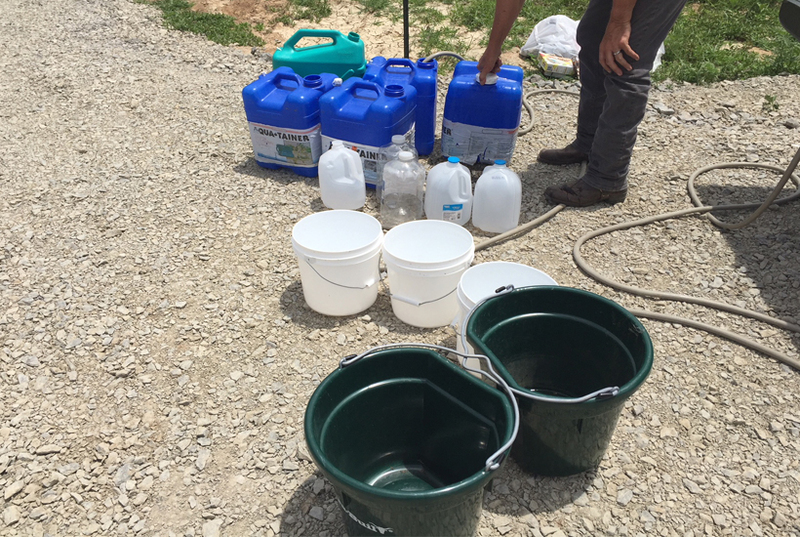 As far as a basic, easy system to set up I’d say holding your water in an IBC is a cost effective simple way to go. Who needs more complications? Not I. Our farm will see many IBC’s popping up in it’s future. We already have one set aside for the garden area. I’m pretty sure we will invest in another one or two for the garden since we plan to enlarge this area in a big way. Rain water harvesting is BIG on our must have list but at the moment we are stretched thin with other infrastructure demands. What about watering the garden right now you ask? Gosh you ARE paying attention! We have a little catch basin in our kitchen sink so that as we wash dishes or our hands, we capture that used water and funnel into a used water bottle (marked specifically for the garden). Once full,we take the bottle to the garden to water or hold until the garden needs water. After I straw mulched the raised beds, we found a LOT less water has been needed to keep our plants happy! Plus we have had enough rain to manually fill the garden IBC. WOOT! If you are in a position where you will need to hold water in an IBC you will have to consider the effects of the sun on your wet friend. That nasty little green bugger: algae will rear it’s ugly head. Our future solve is a PVC box-like frame with a tarp cover that we will place over the IBC to keep the sun from nourishing the green stuff. I should mention: DO NOT PAINT YOUR IBC. The plastic is porous and you will have more problems than algae on your hands if you paint it. 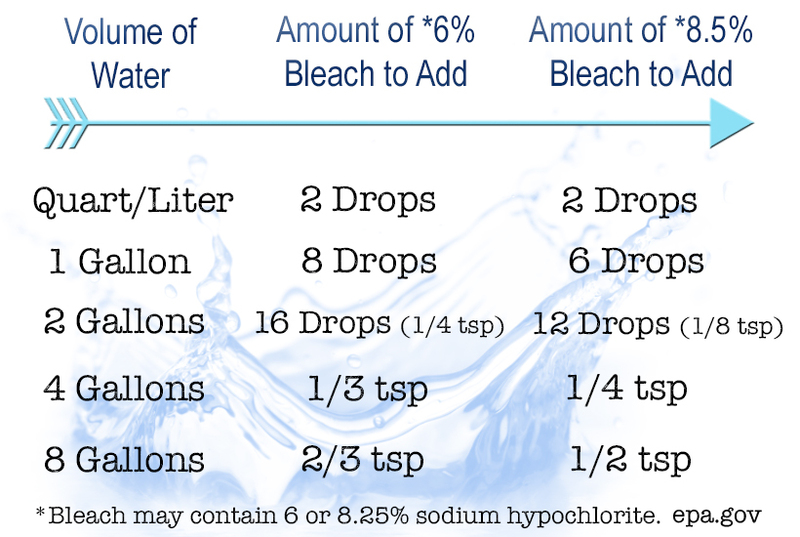 At the moment we add bleach per the standard guidelines published by the EPA. (click here for a printable PDF of this chart). I plan to switch over to a non bleach liquid that I use to sanitize my bottles when I make mead. 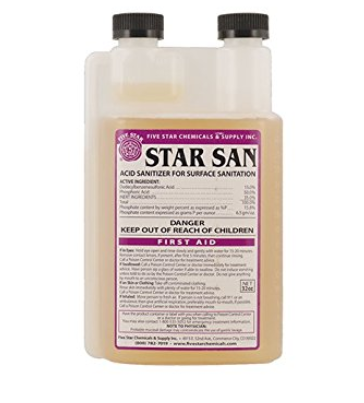 This sanitizer is called Star San. Less toxic and a breeze to use. 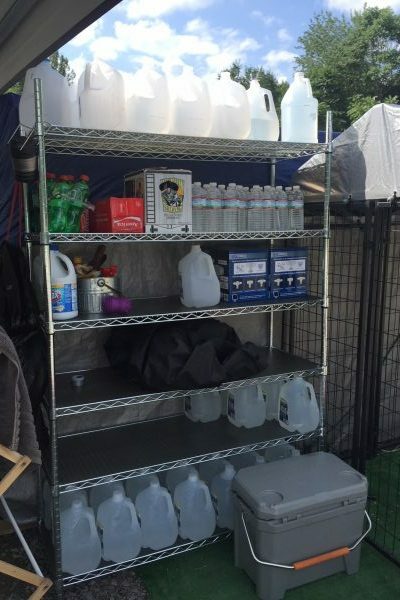 What are your water holding solutions?